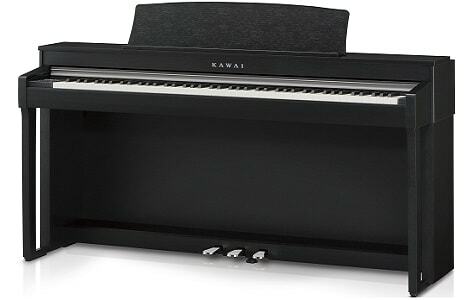 The CN-Series has been a mainstay of Kawai’s extensive digital piano range for several generations, and with each new model, there is an increasing trickle-down of technology from the high-end CA-Series. The CN37 was launched early in 2017, and has the same Responsive Hammer III action as the popular ES8. The triple-sensor key detection, let-off simulation and counterweights enhance the grand piano touch, and make the CN37 a suitable instrument for practising and playing even advanced repertoire. High-quality sounds are needed to provide a suitable range of expression for that responsive action to utilise, and the CN37 obliges with sounds from the Kawai EX and the flagship Shigeru Kawai SK-EX concert grand piano. ‘Harmonic Imaging XL’ sampling records each key individually at a wide range of dynamic levels to ensure a smooth and seamless range of expression is placed at your fingertips. Which of the concert grand sounds you prefer will be a personal choice, depending on the repertoire. The realistic pedal weighting, Ivory Touch key surfaces, and 20 watts per channel speaker system complete a strong package. An internal recorder, USB (to Host) and MIDI facilities add welcome flexibility for the all-round musician. The Concert Magic and Lesson functions are here too: great if there are also beginners in your home.